CHRISTOPHER JOREBON LOEAK, President of the Marshall Islands, said his country had been born first in the hearts and minds of the Marshallese people, but its nationhood had been forged under the auspices of the United Nations. Its unique story deserved reflection, two decades after becoming a United Nations Member State and leaving the Organization’s trusteeship. 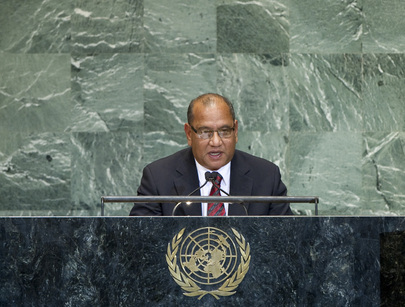 Since 1954, Marshallese leaders had visited the United Nations to address the ongoing impacts of the 67 nuclear tests conducted on their nation’s land while still under United Nations trusteeship, he recalled, describing the matter as a foreign policy issue and more than a mere historical legacy; it was a contemporary reality for local communities. The United Nations had authorized many of those tests through two resolutions adopted in 1954 and 1956, which also made assurances of basic human rights. While acknowledging the important efforts made to date, “half-lives of radioactive material remain for generations, and much more remains to be done”, he said. Today, however, for the first time since the trusteeship resolution of 1956, the United Nations had finally spoken, he said. Earlier this month, the Special Rapporteur on toxic waste, had presented his report to the United Nations Human Rights Council in Geneva regarding the nuclear-testing programme in the Marshall Islands. It presented significant findings that the pain, mistrust, progress and failures of the Marshallese people over decades had a human-rights dimension, and that the international community must respond with more than silence. “The Marshallese people have paid too heavy a price for the only instance in which the United Nations explicitly authorized the use of nuclear weapons”, he said, urging the United States and the wider international community to join in welcoming the report’s specific recommendations. Noting perhaps the most complex challenges posed by climate adaptation to a low-lying nation, he said there was a need to overcome them nonetheless. Efforts in that regard should not rely on an uncertain global climate architecture because the continued survival of the Marshallese people was at stake. The large scale of the future Green Climate Fund — up to $100 billion a year — and other efforts could easily overlook the relatively modest needs of the Marshall Islands. The United Nations should not fail the most vulnerable nations, and it must better capture the efforts of all necessary actors, he continued. He went on to urge other Member States to advance the meaningful participation of Taiwan within the United Nations system and the international community. Building on the successful efforts of the World Health Assembly, Taiwan’s participation as an observer should be accepted within the United Nations Framework Convention on Climate Change (UNFCCC) and the International Civil Aviation Organization (ICAO), he said. The international community should also recognize the strong efforts, and further potential, for Taiwan to help the world meet the Millennium Development Goals. Furthermore, the international community must not fail to act on the most immediate security concerns, he said, recalling that recent tension in the broader Pacific Rim, including the East China Sea, should be addressed through an inclusive dialogue involving all key actors.